Your plan will assist you in achieving what you have identified as the purpose, guiding principles and scope for QAPI. This is a living document that you may revisit as your facility evolves. Tailor the plan to fit your nursing home including all units, programs, and resident groups (for example, your sub-acute care unit, your dementia care unit, or your palliative care program). Think also of the range of residents. Do you have some younger residents? You may need to consciously develop a distinct plan to create quality of life for those residents. Some large organizations or corporations may choose to develop a general plan for all nursing homes in the group—in fact many multi-home organizations already have a corporate quality plan. Flexibility must be built in because individual nursing homes must have a plan that works for them. Leaders at the facility level need flexibility to develop plans for the priorities that fit their needs. 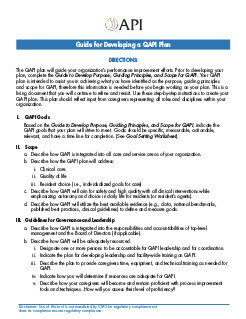 You may use the Guide for Developing a QAPI Plan to help you create a comprehensive plan that addresses the full range and scope of care and services provided by your organization. The QAPI plan will guide your organization’s performance improvement efforts. Prior to developing your plan, complete the Guide to Develop Purpose, Guiding Principles, and Scope for QAPI. Your QAPI plan is intended to assist you in achieving what you have identified as the purpose, guiding principles and scope for QAPI, therefore this information is needed before you begin working on your plan. This is a living document that you will continue to refine and revisit. Use these step-by-step instructions to create your QAPI plan. This plan should reflect input from caregivers representing all roles and disciplines within your organization. Based on the Guide to Develop Purpose, Guiding Principles, and Scope for QAPI, indicate the QAPI goals that your plan will strive to meet. Goals should be specific, measurable, actionable, relevant, and have a time line for completion. (See Goal Setting Worksheet). 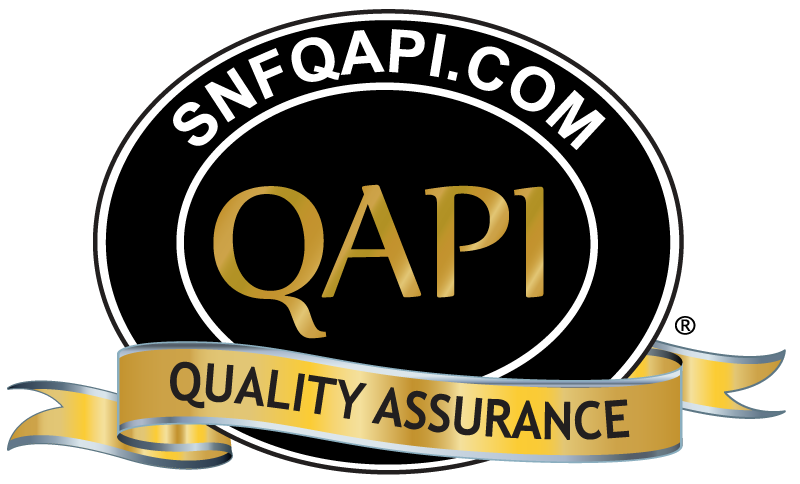 Describe how QAPI is integrated into all care and service areas of your organization. Describe how QAPI will aim for safety and high quality with all clinical interventions while emphasizing autonomy and choice in daily life for residents (or resident’s agents). Describe how QAPI will utilize the best available evidence (e.g., data, national benchmarks, published best practices, clinical guidelines) to define and measure goals. Describe how QAPI is integrated into the responsibilities and accountabilities of top-level management and the Board of Directors (if applicable). Describe how QAPI will be adequately resourced. Designate one or more persons to be accountable for QAPI leadership and for coordination. Indicate the plan for developing leadership and facility-wide training on QAPI. Describe the plan to provide caregivers time, equipment, and technical training as needed for QAPI. Indicate how you will determine if resources are adequate for QAPI. Describe how your caregivers will become and remain proficient with process improvement tools and techniques. How will you assess their level of proficiency? While everyone in the organization is involved in QAPI, you will likely have a small group of individuals who will provide the backbone or structure for QAPI in your organization. Who will be part of this group? Many of these individuals may be on your current QAA committee. Establishing a designated way to document and track plans and discussions addressing QAPI. Describe how the QAPI activities will be reported to the governing body; i.e., Board of Directors, owner. Describe the overall system that will be put in place to monitor care and services, drawing data from multiple sources. Describe the process for collecting the above information. Describe the process for analyzing the above information, including how findings will be reviewed against benchmarks and/or targets established by the facility. Describe the process to communicate the above information. What types of reports will be used? One way to accomplish this is to use a dashboard or dashboards for individual performance improvement projects. Identify who will receive this information (i.e., executive leadership, QAPI leadership, resident/ family council, and a center’s caregivers), in what format, and how frequently information will be disseminated. Describe the overall plan for conducting PIPs to improve care or services. Indicate how potential topics for PIPs will be identified. Describe criteria for prioritizing and selecting PIPs: areas important and meaningful for the specific type and scope of services unique to the facility, requires a concentrated effort on a particular problem in one area of the facility or facility wide. Indicate how and when PIP charters will be developed. Describe the process for reporting the results of PIPs. Identify who will receive this information (i.e., quality committee, resident/family council, and a center’s caregivers), in what format, and how frequently information will be disseminated. Describe how to designate PIP teams and establish and describe a process for assembling teams to work on specific PIPs. Define the required characteristics for any PIP team. This may include that the team be interdisciplinary (i.e., representing each of the job roles affected by the project), that it include resident representation (as appropriate), and that a qualified team leader is selected (i.e., ability to coordinate, organize and direct all activities of the project team). Describe how PIP teams should document and report their work. Describe your process for documenting PIPs, including highlights, progress, and lessons learned. For example, what project documentation templates will you use consistently and file electronically in a standardized fashion for future reference. Any change that is made has the potential to have broader impact than intended. If you are trying to make a change to a specific system or process, it is important to recognize any “unintended” consequences of your actions. Describe how your organization will identify these consequences which may be either positive or negative. Describe the process you will use to ensure you are getting at the underlying causes of issues, rather than applying quick fixes that address symptoms only. Describe how you will monitor to ensure that interventions or actions are implemented and effective in making and sustaining improvements. Outline the audiences for QAPI communications and the frequency and format of these communications. Describe the purpose of this evaluation – to help your organization to expand your skills in QAPI and increase the impact of QAPI in your organization. Determine when you will revisit the plan (i.e., at least annually). Determine how you will track revisions or updates to the plan.